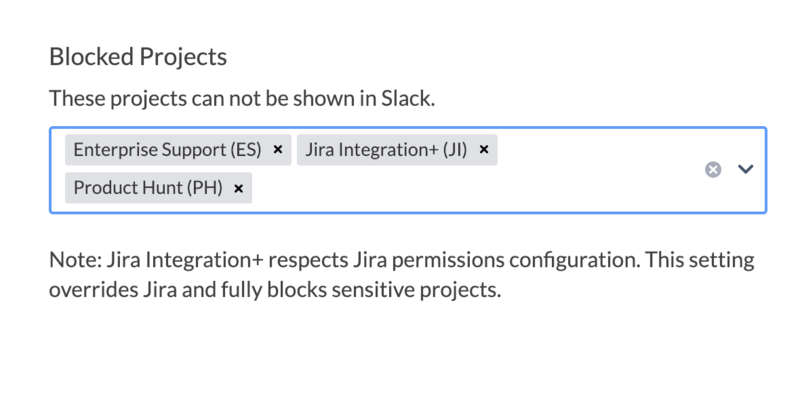 .Follow these steps to block your sensitive projects in Jira from showing in Slack. Jira Integration+ fully respects permissions in your Jira configuration and prevents users from updating projects where they don't have access in Jira. By default we utilize the application link connection to Jira to get ticket information for users and based the projects shown on the permissions of the user that generated the Jira connection. We then request users to authenticate prior to updating issues. We believe in open environments and feel that seeing the issue name but being able to see the details or update the issue is acceptable restriction for most teams. Jira Integration+ also includes the ability to globally disable specific projects in Jira. This configuration ensures the included projects will never go into Slack from the Jira Integration+ bot. To set banned projects login to your account and look for the "Banned Projects" setting. To better understand how the platform will react to your actions lets consider the use case below and the resulting output. Nick enters into slack "MAR-12"
Admin enters into slack "MAR-12"
Slack has no option to respond in a channel but hide from specific users. In this case Admin should not be entering MAR project keys into a channel with non-accessed users. User permissions not longer matter because MAR is blocked in Jira Integration+ configuration. All users cannot view MAR.